RadDataFilter is a control that allows you to filter your data. It allows you to create complex filter criteria by using unlimited number of filter conditions combined by logical operators. This article will show you how to start using this control. 1. Add a RadGridView, a RadDataFilter and the TelerikMetro theme to a form. Set the theme of all controls to TelerikMetro. 2. 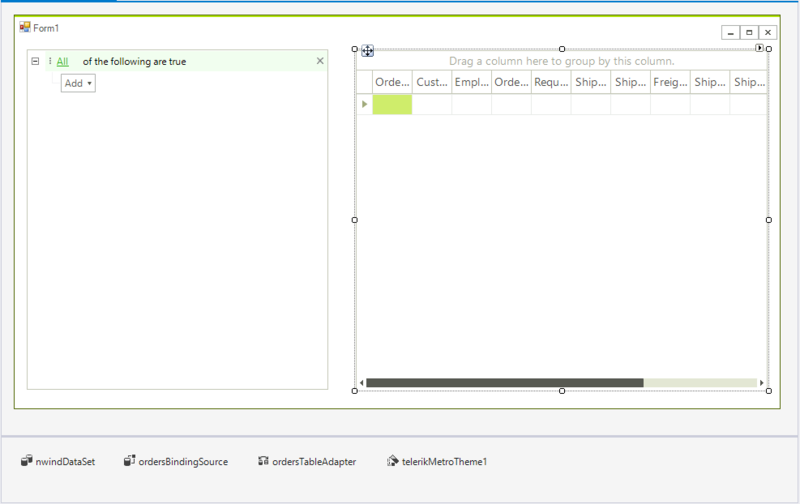 Populate the grid using the Nwind database, use the Orders table as a data source. More information is available here. This way the binding source will be automatically created. 3. 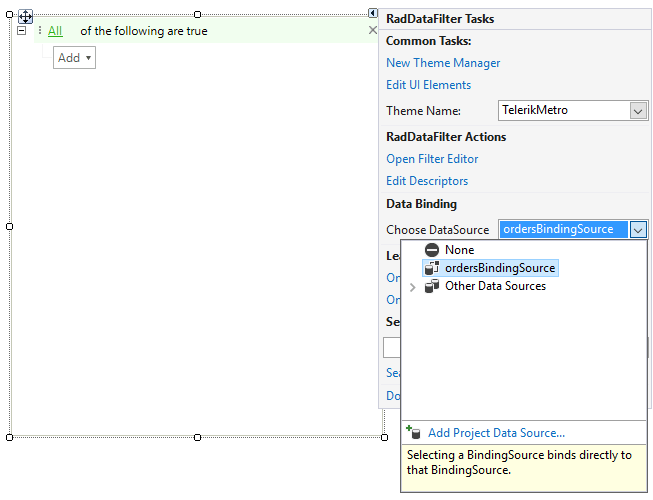 Open the Smart Tag of the RadDataFilter control and select the "ordersBindingSource". 4. When the user adds his filtering criteria, the control automatically produces a filter expression available in its Expression property. To apply this filter to the underlying BindingSource, the ApplyFilter method should be invoked. We can use the control events to call the method when new filter is added by the user for example when an item is applied and when removed. Since the RadDataFilter control is build on top of RadTreeView we can use the NodeRemoved and the Edited events for the purpose. 5. Start the application and add some filters.